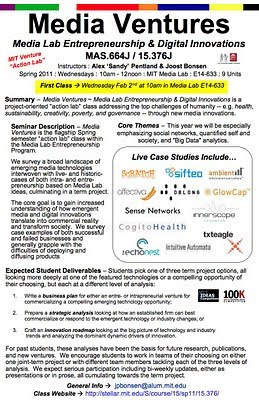 Maximizing Progress: MIT Media Ventures ~ Final Projects 2011! A bunch of the ventures proposed in Media Ventures are getting started, with Upkast featured as Finalist in tonight's MIT $100K Entrepreneurship Competition! Furthermore, the teams pursuing roadmaps and analyses are also committed to having their class efforts have ongoing effect!